Huge Savings Item! 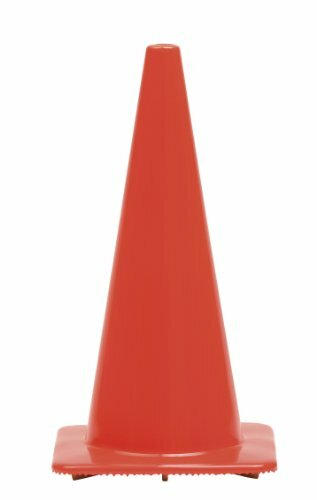 Save 15% on the Work Area Protection 28PVCS Polyvinyl Chloride Standard Traffic Cone, 10-1/2'' Diameter x 28'' Height, Fluorescent Orange by Work Area Protection at N Online Agency. MPN: 271469. Hurry! Limited time offer. Offer valid only while supplies last. Work Area Protection polyvinyl chloride standard traffic high-visibility, durable, high-quality cone. One-piece, flow-molded polyvinyl chloride. Work Area Protection polyvinyl chloride standard traffic high-visibility, durable, high-quality cone. One-piece, flow-molded polyvinyl chloride. Anti-fade, fluorescent orange color. Permanent stenciling available. Broad base for stability. Heat resistance to 160 degrees. Elongation: 200 percent. Tensile strength: 1200 pounds per square inch minimum. Hardness: 80+/-5 conical, 75+/-5 base. Tear strength: 250 pounds per square inch. Meet NCHRP350 requirements. Meet MUTCD and FHWA requirements. Top thickness: 0.075-inches. Bottom thickness: 1/8-inches. Base size: 15-1/4-inches. Hole diameter at top: 1-1/4-inches. Cone diameter at top: 2-3/16-inches. Measures 10-1/2-inches diameter by 28-inches height.